One of my favorite things to do (especially to de-stress) is wine nights with the girls. A bunch of us girls get together somewhere for dinner and drinks... I always end up drinking too many glasses and regret it the next morning, but it's always fun to unwind and have a little girl talk. Last Monday I spotted a GroupOn deal for a new place in Mt. Pleasant that a lot of us have been dying to try - it's called Wine Awhile. 2) Then you decide how much money to put on your card - our GroupOn was $12 for $25.. so $4 for the card and then $21 went on the card. 3) You receive a wine glass and then you make your way to their wine station where they have several different types of wines, ranging in price, set up in this very complex, space-age looking machine. 4) You select a wine you would like to try, stick your card in the machine (your card balance displays on the machine), and then select one of three buttons above the wine of your choice: taste, half glass, full glass. All have prices accordingly - i.e. a taste may be $1.25, a half glass $2.50, and a full glass $5. 5) After pushing the button, a little spout will fill your wine glass with the amount. 6) You drink said wine - then head back to the wine station to try another wine. We munched on different tapas style apps while we drank our wine. They also had a guy playing a guitar and singing for entertainment. When we left, I still had about $11 on my card...but the cool thing is you keep the card and bring it back anytime you visit. The wine selections in the wine station change day to day (they may change throughout the day, not sure). Plus they have different types of beers - so if you want to bring your significant other with you and he's not a wine connoisseur, then there's a variety of beers to choose from as well. My only complaint is I felt it was a wee bit pricey... maybe I've been spoiled with generous pours, but I didn't think their half glass and full glass were quite the pour I expected them to be, especially for the prices. I can get a FULL glass of a tasty house Chardonnay during Happy Hour at Bambu (another restaurant in Mt. Pleasant) for only $3. Plus, paying $4 up front for just the card seems a little unreasonable to me as well. Oh, and they close at 9pm - which I felt was way too early for a wine bar. What if you wanted to do wine and dessert after a date? This place would be excellent for that...but they close too early. Regardless, it was really a neat concept and allowed us to try several different wines without having to order full glasses of each. I'm usually not picky when it comes to wines, but I love wine tastings and having the opportunity to sample different kinds of wine in one sitting. Plus not having to get a full glass each time, just a taste here and there, probably makes it affordable in the long run. that sounds so fun. i think we may have something similar in Greenville. i need to find out ASAP. Just to clarify what wine awhile is about. 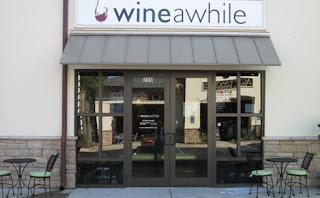 Its not a wine bar its a wine shop that has fun special events like live wine down Fridays in which they feature local live music. Also you will not find cheaper by the glass pour anywhere that uses quality wine and no where can you have a taste or have a 1/2 glass of 24 different wines. Sorry Bambu is pouring you a $5 bottle of wine and charging you $3 for a glass. Just thought you should know. Anthony is a great guy and has an amazing business so you should find out the scoop before you blog an opinion even though for the most part it was a nice blog.